A pair of wooden oak panels are displayed inside the porch of St Mary’s Church. Unlike most memorials for the Great War, these simple wooden panels were created, and had many of the names (but not all) of the fallen carved upon them, while the war was still in progress. The materials, probably bog oak, were provided by Sir Charles Jessel of Ladham House, and the panels were made and installed by the local building firm of Davis & Leaney, who also mounted a cross on the top of each one. 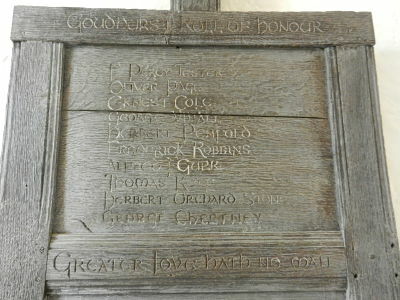 The first panel has the carved heading “Goudhurst Roll of Honour” and, on the three lower cross-pieces, the text “Greater love hath no man than this, that he lay down his life for his friends” (John 15:13). The second panel bears on three of its cross-pieces the text “In the sight of the unwise they seemed to die … but they are in peace” – a quote from the Wisdom of Solomon, 3:2-3. The names of the fallen are recorded with a Christian name and sometimes initials as well, but without reference to rank or regiment, giving the memorial a homely, personal feel. The earlier of the two wooden panels records 29 names. The second wooden panel records 28 names.